In the past, you’ve had to add people to your entire team. Developers: Do you really want nosy, unfamiliar eyes prowling around just to review a simple update? Marketers: Do you really want sales checking in to see how your collateral is progressing? Sales: Do you really want your CEO to have unfettered access to your latest deal info? Okay, you get the picture. So even though you’re one organization, you could use a few fences around your work…but you still need to share tasks and projects. You’d have to add people to your team and then quickly boot them out. No more. We’ve removed that burden and made it even more frictionless. We’ve completely revamped what Sharing and Privacy means in ClickUp. 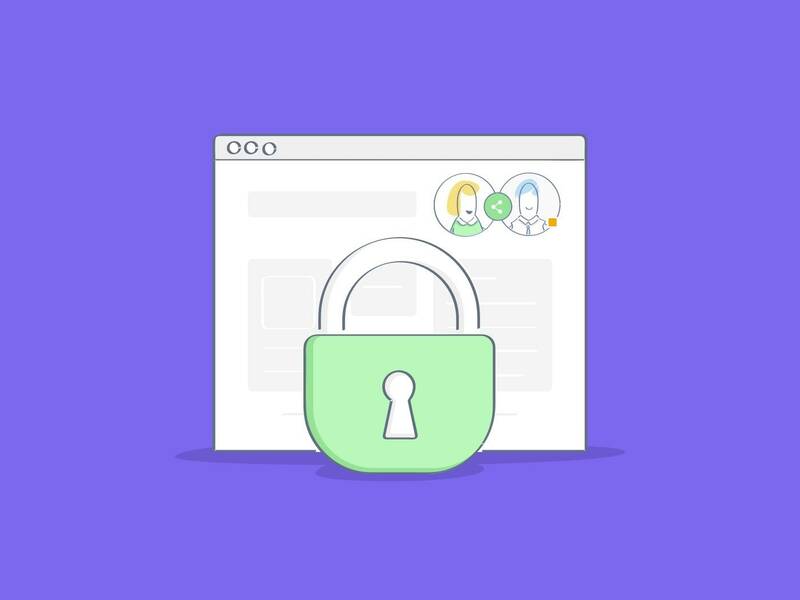 This latest release means you’re in complete control of who sees what, what permissions they have, and who gets added to your team. ClickUp now has guests. You can collaborate, share projects and tasks with those that aren’t ClickUp members. This is amazing for product teams working with vendors, or agencies serving clients and so much more. Guest can be limited to only certain aspects of a Project or task! Invite as many guests as you want on the free plan, but if you’d like to restrict their permissions, you’ll need to upgrade. With an upgraded plan you’re able to restrict guests to view, comment, or edit only access. Unlimited plans get 5 free Guests and 2 additional Guests every Member on the team. Additional Guests, will add a Member seat to your team – so for each Seat, you get one member plus one free Guest! For more on roles (including guests, members and admin privileges, check out this help doc). With this new release, you’ll get better sharing of Projects, Lists and tasks to help your team member work on the Projects and tasks that matter specifically to them. This will help your team focus, get the work or details they need without sharing what they don’t need. By default, an item will be “public” – meaning it’s shared with the parent task and anyone who has permissions. With both “public” and “private” items, you can invite people to participate. You can invite Guests (people not on your team) and Members (people on your team). These are the perfect cases to use permissions with different editing, commenting and view features. Permissions can be set for everyone – including both Guests and Members. You can set permissions for both Public and Private items. 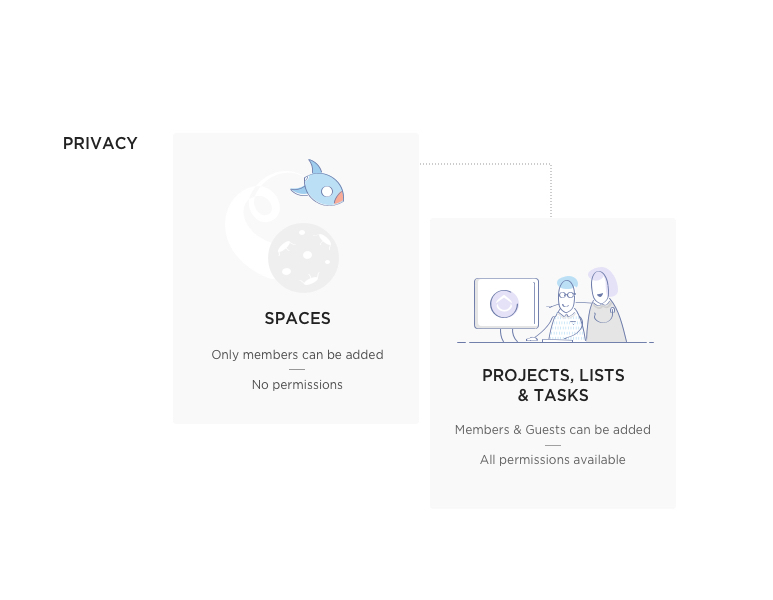 Here’s an overview of permissions. Make the world more productive. To recap, now you can share with anyone, customize privacy, set permissions, and add Guests to ClickUp. With these tools, we hope to enable you to be more productive, and eventually gain extra time in your life.